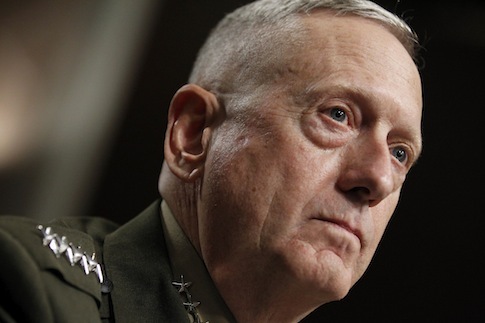 House lawmakers on Thursday approved a short-term funding bill that would expedite the process of confirming retired Marine Gen. James Mattis as secretary of defense. The House passed the continuing spending resolution in a 326-96 vote on Thursday, moving the must-pass spending bill to the Senate just shy of the Friday midnight deadline to fund the government. The legislation includes language that would set up expedited consideration of a waiver needed for Mattis to serve as defense secretary in President-elect Donald Trump's administration. The draft of the continuing resolution, released by House Republicans on Tuesday evening, came amid warnings from Democrats not to include waiver language in the spending bill. Mattis, a retired four-star Marine general who is widely respected among lawmakers and military officials, needs the congressional waiver to serve in Trump's cabinet because he has not been separated from the military for seven years. The continuing resolution approved by the House would fund the government through April 28 and give the Senate Armed Services committee five days to take up the waiver after it is introduced, after which it would go to the Senate floor. The language included in the continuing resolution also would cap Senate floor debate on the waiver at 10 hours. The waiver would still need to pass the Senate by a 60-vote threshold in order for Mattis to advance to hearings before the Senate Armed Services Committee. House Minority Leader Nancy Pelosi (D., Calif.) warned Republicans against putting the waiver itself into the continuing resolution. However, she told reporters on Wednesday that she does not expect the language to be an obstacle for most House Democrats. The continuing resolution could face more hurdles in the Senate, as Democratic Sen. Joe Manchin (D., W.V.) signaled he might hold up the bill over health benefits and pension plans for retired coal miners. Some Democratic senators have also criticized the way Republicans are using the spending bill to fast-track Mattis' confirmation process, according to the Washington Examiner. If the Senate does not pass the continuing resolution by midnight Friday, the federal government will shut down. The bill keeps funding for most programs at fiscal 2016 levels, but it does boost spending for some high-priority Defense Department programs, including funds for the Ohio-Class Replacement Submarine, authority for multi-procurements of the AH-64E Apache and UH-60M Black Hawk helicopters, and authority to use funding for Air Force KC-46A Pegasus refueling tankers. It also provides additional funding for overseas contingency operations, including $5.8 million for the Defense Department and $4.3 million for the State Department and USAID. Trump formally introduced Mattis as his choice to lead the Pentagon on Tuesday night at a rally in Fayetteville, North Carolina. The president-elect cheered the retired Marine as "one of the most effective generals that we have had in many, many decades." While Mattis has been praised by both Democrats and Republicans as well as current leaders at the Pentagon, a few Democrats have vowed to oppose the waiver. Soon after reports emerged last week that Trump had chosen Mattis for defense secretary, Sen. Kirsten Gillibrand (D., N.Y.) said she would oppose the waiver, citing the need for civilian control of the military. Rep. Ruben Gallego (D., Ariz.), a Marine Corps veteran, followed on Monday. Meanwhile, former Defense Secretary Leon Panetta told the Washington Post on Saturday that Democrats should approve a waiver to allow Mattis to become defense secretary under the Trump administration. Current Defense Secretary Ash Carter has also voiced support for Trump's choice, congratulating Mattis and describing him as a friend he holds in "the highest regard."